Be sure that workers can always be seen clearly, even in inclement weather conditions. Fluorescent polyester vests feature 3M Scotchlite high-intensity reflective 2" wide stripes for added visibility. Vests have a velcro front closure. 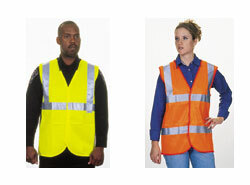 Vests meet ANSI/ISEA standards for use in traffic up to 50 mph. Conney Safety Products, 3202 Latham Drive, Madison, WI 53744. Tel: 800-356-9100; Fax: 800-845-9095.